Before we begin: Please note that this tutorial was originally written for Photoshop CS5 and earlier. If you're using Photoshop CC or CS6, you'll want to check out our fully updated Turning Text Into Gold With Photoshop tutorial. 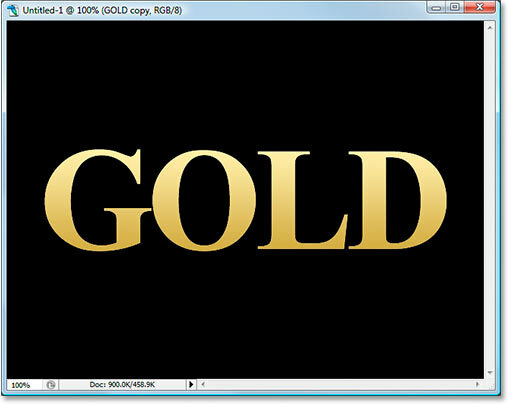 In this Photoshop text effects tutorial, we're going to learn how to turn text into gold using Photoshop's Layer Styles. We'll even throw in some sparkles at the end to make our gold letters really shine. The final gold plated text result. Once you've created the gold text, be sure to check out Part 2 of this tutorial where I show you how to easily change the background behind the text! Let's get started! Create a new document in Photoshop. I'm using the 640x480 preset size. The Background layer now filled with black. Set your foreground color to white and enter your text. Resize the text with Free Transform. Photoshop's Layers palette now showing three layers. We're going to be working on the text copy layer throughout the next few steps. Click the Layer Styles icon at the bottom of the Layers palette. Select the Gradient Overlay layer style from the list. 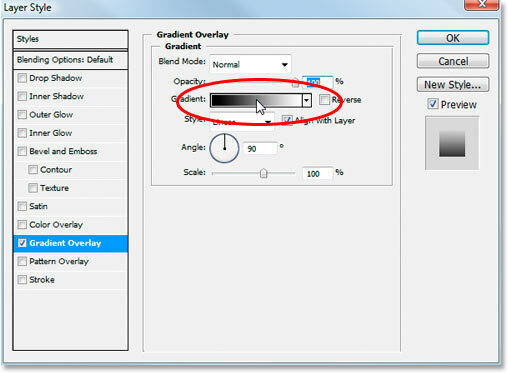 Photoshop's Layer Style dialog box set to the "Gradient Overlay" options. We're going to set the colors for our gradient, so click directly on the gradient preview area (circled in red above) to bring up the Gradient Editor. Click on the left color marker in the Gradient Editor, then click the Color swatch. Enter R:247, G:238, B:173 for the left gradient color. Click on the right color marker, then click back on the Color swatch. Enter R:193, G:172, B:81 for the right gradient color. Click OK to exit out of the Color Picker once again, and click OK to exit out of the Gradient Editor as well. The gradient colors applied to the text. Don't exit out of the Layer Style dialog box yet. We have more to do. Step 8: Change The Gradient "Style" To "Reflected"
Change the gradient style from "Linear" to "Reflected". The text after changing the gradient style. Click directly on the words "Bevel and Emboss" in the menu on the left. Step 10: Change The "Technique" To "Chisel Hard"
Change the "Technique" from "Smooth" to "Chisel Hard". Step 11: Change The "Gloss Contour" To "Ring Double"
Change the "Gloss Contour" to "Ring Double". Select the Anti-Aliased option as well to prevent our text from getting the "jaggies". Drag the "Size" slider to the right until you've closed up the open spaces inside the letters. After dragging the "Size" slider to the right, the open spaces inside the letters have been removed. Drag the "Depth" slider to the right to enhance the lighting effect on the letters. The effect after increasing the "Depth". 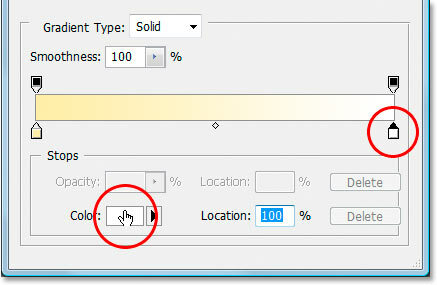 Click inside the "Contour" checkbox to enable it without viewing its options. The effect with the "Contour" option enabled. Select the "Inner Glow" layer style. Click directly on its name to bring up the options for it. First, change the Blend Mode to Multiply. Then lower the Opacity to 50%. Click on the color swatch directly below the word "Noise", which brings up the Color Picker. Enter R:232, G:128, B:31 to give us an orange color (this one was sampled from a photo of a gold brick) and click OK to exit out of the Color Picker. Finally, increase the glow Size to 15 pixels. The text after applying the "Inner Glow" layer style. With the original text layer selected, click on the "Layer Styles" icon at the bottom of the Layers palette. Select the "Stroke" layer style from the list. The "Stroke" layer style options. First, increase the stroke Size to 5 pixels. Then change the Fill Type from "Color" to Gradient. We're going to be using the same gradient colors for the stroke that we used on the text. Before we go setting gradient colors though, change the gradient Style to Reflected. Click on the gradient preview area. The gradient stroke applied to the text. The "Bevel and Emboss" options to apply to the stroke. First, in order to apply these settings to the stroke, we need to change the top option, Style to Stroke Emboss. Now all of these settings will be applied to our stroke. Change the Technique to Chisel Hard once again. Set the Size to 5 pixels. In the "Shading" section, click on the down-pointing arrow to the right of the words Gloss Contour and once again select that Ring - Double option, which is the third one from the left on the bottom row. Finally, over on the left in the menu area, once again click inside the Contour checkbox to enable it. The effect after applying the "Bevel and Emboss" style to the stroke around the text. The options for the Outer Glow layer style. First, lower the Opacity value to 50%. Then click on the color swatch directly below the word "Noise", which brings up Photoshop's Color Picker. 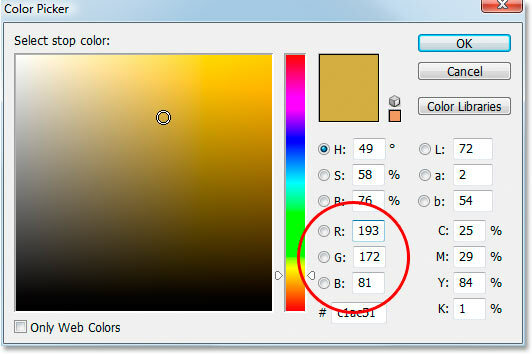 Enter in R:183, G:145, G:79 for the color (another gold brick photo sample) and click OK to exit out of the Color Picker. Finally, set the Size to around 29 pixels, and then click OK to exit out of the Layer Styles dialog box. The text now with a faint glow around it. Photoshop's "New Layer" dialog box. 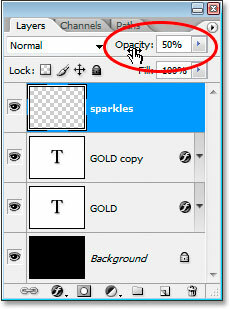 Name the new layer "sparkles" and click OK.
Photoshop's Layers palette now showing our new "sparkles" layer at the top. 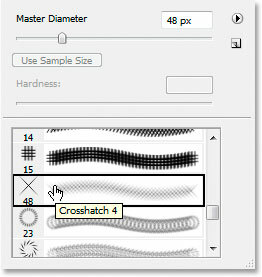 Step 21: Load The "Assorted Brushes"
Click the small arrow in the top right corner of the Brush menu. Click on "Assorted Brushes" in the list that appears. 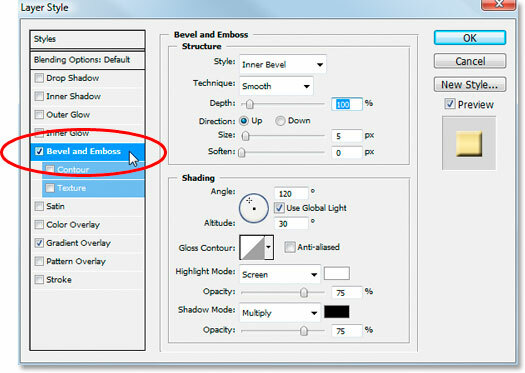 Click "Append" to add the new brushes to the existing ones. 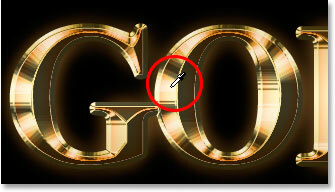 Sample a light gold color from the text with the Eyedropper tool. Choose one of the "Crosshatch" brushes (which looks like an "X") to use for the sparkles. With your brush selected and your sampled color ready to go, click in a few random locations around the text to add some sparkles. 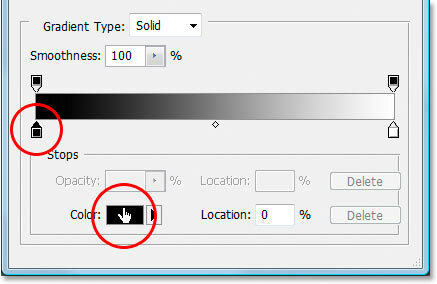 Change the brush size after each click to add even more randomness by using the right and left bracket keys to increase or decrease the brush size on the fly. Adding sparkles is fun, but too many is too many, so only add a few. A couple of larger ones and a couple of smaller ones should do it. Lower the opacity of the "sparkles" layer to reduce their intensity. And there we have it! Now that you've created the gold text, check out Part 2 where I show you how to easily move the effect onto a different background! Or visit our Text Effects or Photo Effects sections for more tutorials!